The Boston Bruins are trying to get to the NHL playoffs. No problem, right? THE BRUINS WON! I REPEAT: THE BRUINS WON! Hey Bruins. You really need to win games so, like, start winning games. Tonight we humbly ask for mercy and ever so nicely ask for a win. On this holiest of weekends, may the Bruins rise from the dead and deliver us from the evils of No Goal, Inconclusive, Offsides Challenge, and Penalty Box. 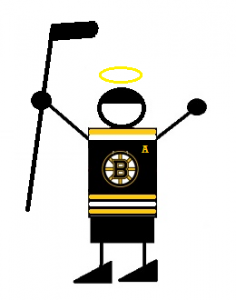 In Saint Patrice’s name we pray. This week we discuss the Bruins 2-1 defeat against the LA Kings, Ryan Spooner’s rise to the third line and more. Jordan Caron makes an appearance. He’s a horse. And he rides. We end it with the Bear Necessities and Nick singing in the dark. Enjoy! Morning Free Association: WTF is Happening?